Welcome to Circle of Gifts, the free, easy, and fun way to manage presents for all your favorite people. At circleofgifts.com you can track and claim gifts that your family and friends have listed. This way four of you won't end up giving Johnny a tuba for his birthday. 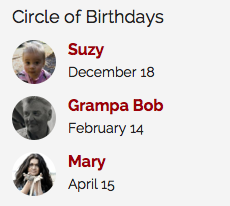 You can track upcoming birthdays and holidays. 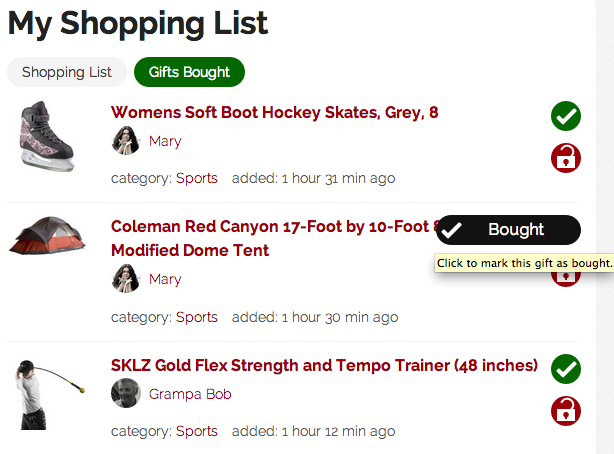 Your claimed gifts become a shopping list so that you can remember those items you bought early and buried in the back of your closet. Help your family and friends by keeping a running list of things you might want and avoid that sudden mental blank as those special days appear on the horizon. Start your own circle and begin listing your gifts now.